Fayetteville State University is known for "Academics that Work." By providing the highest quality learning experience at an affordable cost, we fulfill our mission to promote the educational, social, cultural, and economic transformation of southeastern North Carolina and beyond. Or look at our over 60 degree programs in our Program Finder! Our lively campus offers you opportunities to learn, explore, play, and make an impact. 93% of our students are from North Carolina. At FSU, we'll help you achieve what you've always envisioned and even that which you never imagined! Academic and social organizations enhance leadership ability, social skills, and your identity. Find where you fit! Fayetteville State University offers degrees at the bachelor's, master's, and doctoral levels. Committed to excellence in teaching, research, and service to the community, the university seeks to prepare its students and graduates to lead meaningful and productive lives. Baccalaureate - 33 disciplines, including biology, business, chemistry, computer science, criminal justice, education, forensic science, music nursing, psychology, social work, sociology, and visual arts. The mission of the Division of Academic Affairs is to ensure that a quality educational experience is available to students who enroll at Fayetteville State University. 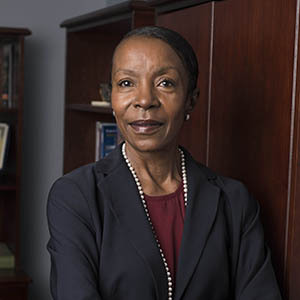 Since joining the FSU faculty in 1999, Dr. Pamela Jackson has served in various administrative roles, including as Dean of Business and Economics since 2015. She guided the college in earning reaffirmation of accreditation by the Association for the Advancement of Colleges and Schools of Business (AACSB), the most prestigious accrediting bodies of business schools. Under her leadership, the College of Business has earned national rankings from U.S. News and World Reports, the Princeton Review, the Social Science Research Network, and others. She has earned nearly $5 million in grant funding, increased philanthropic support for the college, and implemented community outreach programs such as the Youth Entrepreneurship Conference and Youth Entrepreneurship Day. She is a member of the Greater Fayetteville Chamber Board of Directors, City of Fayetteville Audit Committee, Cumberland County School's Career and Technical Education Advisory Council, and Fayetteville Urban Ministry's Find-A-Friend Advisory Board. As Provost, she will have primary responsibility for ensuring the quality and effectiveness of degree programs, instruction, and academic support. When you are enrolling in courses at FSU, keep these three things in mind: 1. Always be open minded. 2. Study and ask questions. 3. Have fun, enjoy and experience everything the professor has to offer.